We have a long history with the WRF, from doing pre production testing with Geoff Ballard and Yamaha Japan in 2000 on the 250F to preparing and testing suspension from everything from trailriding to Six days competition. We helped Ballard's Offroad with their racing program, with great results. We know it very well from 1998 to present and we can get the most out of it, whichever model or year, and whatever type of riding you want to do. We stock a full range of Seals, Bushes, Springs and many other spares for WRF Forks and Shocks - at the bottom of the page you will find a list of models and years you can click on to go to your specific bike. A step to YZ based WR's has been a great move from Yamaha. The forks are still the MX units with offroad settings. If you find the fork too stiff initally and then blows through and it easy to bottom, we can change the fork so its supple on the small bumps and very hard to bottom. We developed some great settings with Greg Yager when we worked on the WR450F Adventure bike project with him. 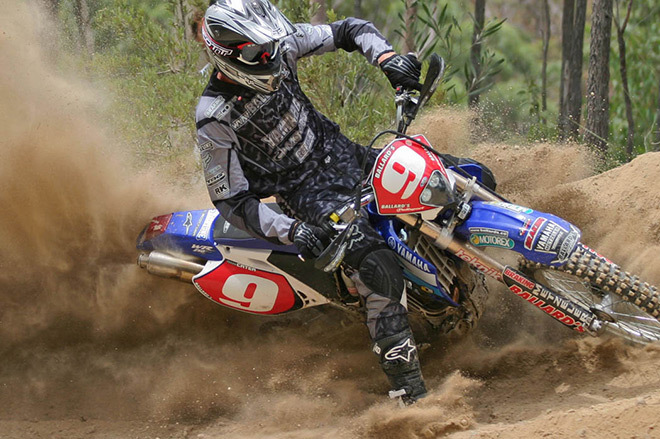 These settings are at home in the bush or on a club MX day. 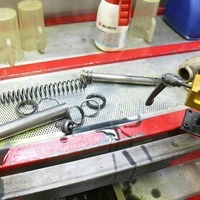 Just ask us for a revalve, we know why you want to change the fork setting. The first EFI WR. It was an unusual bike, being a YZ250 2-stroke chassis and a rehash of the old engine. The forks were the YZ style closed chamber KYB units and worked well, but like a lot of MX devived forks they are a bit firm initially for trail use, then blow through and are easy to bottom. This is easily fixed with a setting change (revalve). These models had an unusual fork design in the cartridge that benefits greatly from our 25-029-00 Fork T-Valve Kit. 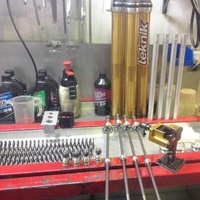 This will give the fork some much needed damping character and actually make the fork more forgiving and less harsh. There are so many complaints we hear about this fork, it really lets the bike down but it can be fixed and makes for a great bike as the engines are very strong and simple, running carburettors. For one orphan year, when Yamaha changed from 46 to 48mm forks we got a 25mm cartrige fork. No idea why, some test riders whim we guess. It's not a stellar performer but we can make it a lot better with valving changes. Essentially all these forks are the same. 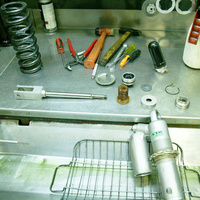 We used to fit hydraulic bottoming cone kits from Suspension Tech in NZ. The stock fork used a rubber bump bottoming stop that was too short to be effective, a cylinder valve that clogged up with plastic debris from the spring guides smashing into the bumpers and was, generally an OK fork if everything was going OK. We still have all the settings from the work we did back then - and with the aid of some shock dyno development we can now make those forks far better than ever before. All the late model WR's use a 50mm KYB shock. While it's nearly a carbon copy of the YZ, if you find it a bit abrupt on the trail chop and it kicks you in the bum a few more times than you like we have developed some alternative settings for the shock. Expect better drive, a more boring, less active shock when we have made changes. It's amazing then the 46mm KYB shock that is common to all these models over such a span of years is essentially the same shock. While it's had different springs and valving settings over the decades, it's still the same 46mm KYB unit at heart. If we have a criticism, it's the rebound adjuster. It's too coarse in adjustment, one click is a big jump. This was addressed in the later 2015- models.